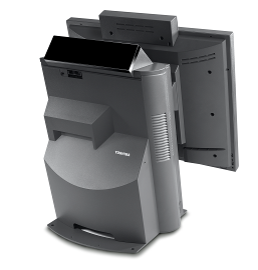 We think the Toshiba SurePOS 580 is simply the best tower POS terminal designed. Ever. The sleek, slim Toshiba SurePOS 580 offers industry-leading, highly accurate infrared (IR) touchscreen technology as part of it’s standard configuration. 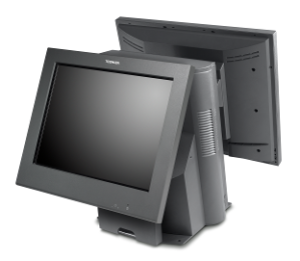 Unlike other touchscreen monitors, the SurePOS 580 touchscreen never requires recalibration—reducing service calls, costly downtime and errors. The advanced “bare glass” technology, allows for a brighter, higher contrast screen when compared to “resistive” touch screens, and similarly higher durability because there is no clear plastic “film” to damage over time. 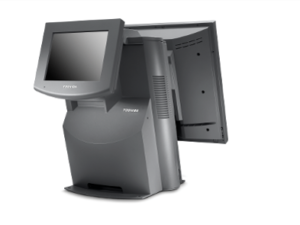 The SurePOS 580 monitor features adjustable touch sensitivity, allowing cashiers to modify the speed of the monitor to their preference, improving accuracy and performance. Finally, the Toshiba SurePOS 580 touchscreen is completely sealed to protect it from accidental splashes and on-screen spills. Toshiba SurePOS 580 fingerprint reader mounted on the lower left corner of the monitor. The Intel Core i5 processor is standard on the SurePOS 580 and has enough power to run even the most demanding POS software applications. 8GB of RAM ensures that there is enough longevity in the machine to handle the next generation of upgrades as well. The 128GB SSD hard drive option provides the access speed, durability and peace of mind that can only come from Toshiba POS hardware. You would think that a POS terminal this powerful would consume a lot of energy and generates a lot of heat, right? Nothing could be further from the truth. According to Edison Group research the Toshiba SurePOS uses less power and generates less heat than it’s closest competitors, thanks to its 80+ gold power supply, superior airflow management, and energy-saving “Deep Sleep” technology. 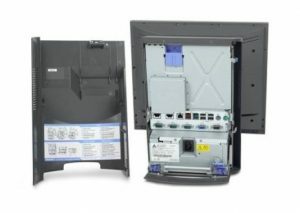 Toshiba SurePOS 580 tailgate showing connectivity options including: 2 drawer ports, 1x LAN, 6x USB (including a 1x12V and 1x24V), 4x RS-232/serial (including 1 powered), 1x VGA, 1x mouse, 1x keyboard. To assist owners and IT managers alike, Toshiba has included its iconic “Light-Path Management” technology which indicates at a glance the status of the POS terminal in the event of a hardware failure. Handy indicator lights show the operator clearly what is wrong with the POS terminal with 4 simple lighted icons: Power Supply, Hard Drive (SSD or HDD), Processor Fan, and Memory. Light-Path management reduces downtime, service call cost, and it can reduce service “recalls” due to incorrect diagnosis. To make the SurePOS 580 even better for serviceability, it features an ingenius tool free design that allows the technician to change even the most important parts without ever having to get a toolbox. Clearly another intelligent solution built into an already impressive POS terminal from Toshiba. Connectivity has always been good with Toshiba POS and this POS terminal is no exception. The Toshiba SurePOS 580 comes with 7 USB ports (including 1x 12V and 1x 24V), 4 RS-232/Serial ports (1 powered), 1 gigabit LAN port, two cash drawer ports, 1 secondary VGA port, a mouse and a keyboard port. To complete the package the Toshiba SurePOS 580 has a variety of optional components such as Magnetic Swipe Reader (MSR), Fingerprint Reader, and a wireless antenna bonnet for wireless POS installations. It also has three choices for rear mounted customer displays – a 2 line x 20 character LED customer display, a 6.5″ LCD customer display, and an adjustable large LCD customer display option. The perfect set of options for a near perfect POS terminal. Toshiba SurePOS 580 with the rear vanity cover removed. Now more than ever, merchants are looking for differentiation when choosing their POS hardware. They expect a higher level of satisfaction—better speed, durability, functionality, quality, service, and more convenience. The Toshiba SurePOS 580 series POS terminal will provide fast, accurate transactions, and when performed by capable, informed employees it contributes to a positive experience to help promote customer loyalty. Toshiba SurePOS 580 rear view with 6.5″ LCD rear mounted customer display. Toshiba SurePOS 580 rear view with 2×20 LED display and wireless antenna bonnet. 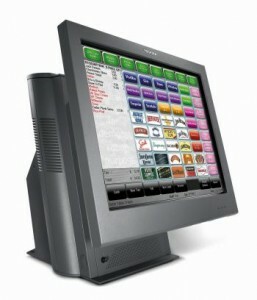 Toshiba SurePOS 580 with rear mounted LCD customer display. Sleek, Slim Design Enhances your store image. Fits in smaller checkout spaces. Industry Leading Infrared Touchscreen Fixed optical alignment never needs recalibration. Brighter screen, higher contrast and reduced glare. Maintains high accuracy and speed. Accepts a wide variety of input devices. Totally sealed screen resists damage from spills. 6.5″ VGA LCD Customer Display Biometric Fingerprint Reader Meets high customer expectations for interactive information, fast and accurate service, expanded checkout options and improved security. USB, Serial and Express Card Connectivity Easy to connect peripherals, RFID technology and wireless communications. Powered USB ports eliminate external power bricks. Standard and powered RS-232 ports support current and legacy POS peripherals. Use of third party Express Card expands POS placements. System Matched Peripherals Designed to work with and color match the Toshiba SurePOS™ family of products. Helps reduce the risk of integrating components from multiple vendors. Deep Sleep Automation The system is in a low power mode and conserving almost as much energy as in the off state. Unlike powering down, deep sleep is much faster and more reliable to get your system up and running when it is needed again. Highly Efficient Power Supply and Energy-Saving Intel Processor Significantly lowers power consumption. 100% Recyclable Packaging with Inserts Made from 100% Recycled Material Helps reduce landfill waste, disposal costs and environmental impact. Toshiba Remote Management Agent Toshiba Light-Path Management Makes systems easy to manage and service with remote management, monitoring and visual indicators that helps avoid problems and reduce costs and downtime. Tool Free Design Helps reduce costly service fees and downtime. 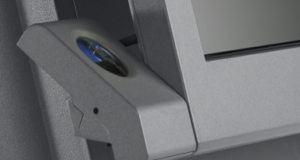 Biometric fingerprint reader (optional) Helps manage risk and fortify security. Access to serviceable parts can be restricted in high risk areas. Toshiba Retail Hardened Helps systems withstand severe thermal and humidity thresholds, spills, extensive vibration, power fluctuations and radio interference. Ensures reliable operation in demanding environments. Intel Processor Choices From Celeron to Core i5 to Help Run the Latest POS Software Helps prepare retailers for advanced POS and point-of-service applications. Integrates new technologies as retailers’ needs change. Supports applications from authorized Toshiba Business Partners. Limited Warranty†† One year Depot or On-site service. Technical support 24×7 Armagh System Support during warranty period. * For a copy of terms and conditions of Toshiba’s statement of limited warranty, contact Armagh. † GHz refers to only microprocessor internal clock speed; many factors affect application performance ‡ MB/GB equals one million/billion bytes when referring to storage capacity; accessibility may be less § Memory supports both system and video. Accessible system memory will be the installed memory size less the amount defined for video §§ Generally available upgrade options to 16GB on Model 580. All are capable of a maximum of 32 G. RPQ required.